Downtown Vancouver has plenty of tall buildings – in fact quite a few taller ones now than when I took this picture in 2010 – but they are dwarfed by the Coast Mountains in the background. 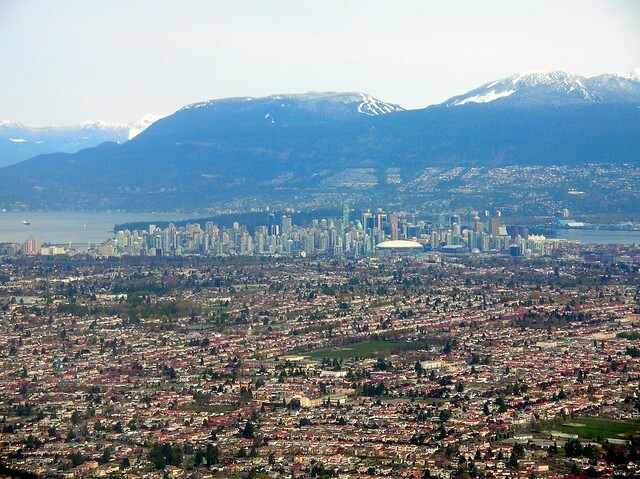 That’s Cypress Mountain in the middle of the skyline – this was in April but there was still snow on the ski runs. Click on the image to be taken to the photo page on flickr. You can get a larger size if you like it – and you could, if you want to – click on the star to “fave” it. This is the perfect photo for this challenge! I live in Victoria so I know this sight well! I visited my sister and her family in Vancouver. I guess I didn’t get to a place to see this gorgeous view of comparison. Excellent photo for the challenge! Oh, no wonder you could get that view. I like taking photos from the plane also, especially the sunset above the clouds! I don’t like being picky, but this is an error I see way too often and I have to correct it. There is no such mountain as Cypress Mountain, at least on the North Shore. The mountain in the centre of the photo is Black Mountain, with Mount Strachan to the right. Cypress Mountain is the name of the ski resort. Well you are of course entitled to your opinion but you might have noticed that I actually linked to the ski resort and referred to the snow on the runs. So if anyone is in error it is you.